Shattered Comics and Matt Dimasi are releasing a special Amazing Spiderman #800 with the mosaic homage to Amazing Spiderman #300 . The cool thing, 100% of the profits of the sale go to charity. 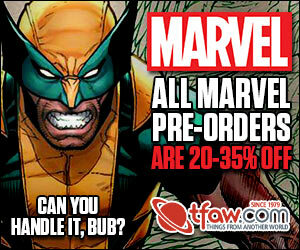 In addition, there will be signed, graded, and remarked copies that 100% of the sale (all the money) goes to charity. Here is your chance to get an awesome comic and help do some good! 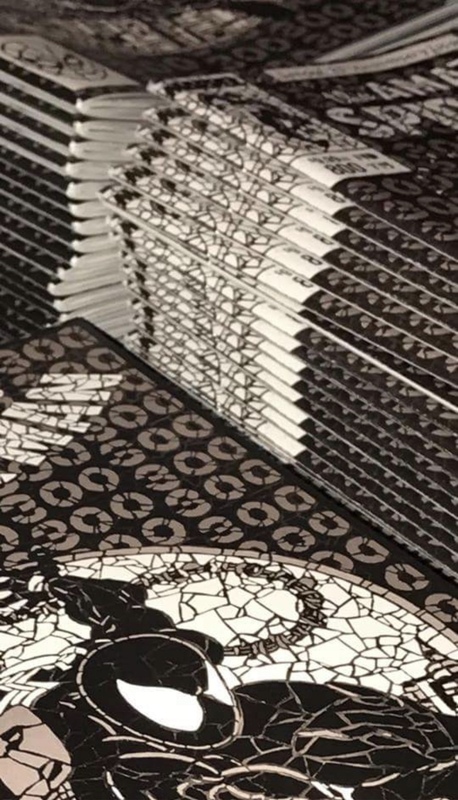 Shattered Comics wanted to find a way to give back, so when we did the variant for the ASM 800’s, we had 1000 copies (Marvel’s minimum) of a Black & White version made & held for a special October fundraising project to help in the fight against Breast Cancer. October is Breast Cancer Awareness Month and it’s time to “Think Pink”! We had 50 copies graded that Matthew DiMasi (artist and owner of Shattered Comics) SIGNED / NUMBERED & REMARKED in PINK sharpie. Each one has unique pink accents and no 2 are alike!! Matthew DiMasi also worked with CGC on making sure the labels on each CGC book reflected the uniqueness of each individual numbered issue (& ONLY 50 of the Pink Remarked editions EXIST!) Matt will not sign another B & W edition in Pink, ONLY these 50! ~ 31 of these 50 will be auctioned off on Shattered Comics eBay page. ONE each day during the month of October (Breast Cancer Awareness Month) with 100% of the proceeds going to Making Strides of Concord NH! 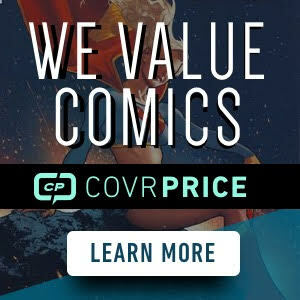 In addition to 100% of the sales of the 50 unique, graded, signed & remarked Pink editions, Shattered Comics has committed to making an additional contribution from the profits of the sales of the raw copies as well! All contributions will go to Making Strides of Concord NH, a division of The American Cancer Society. 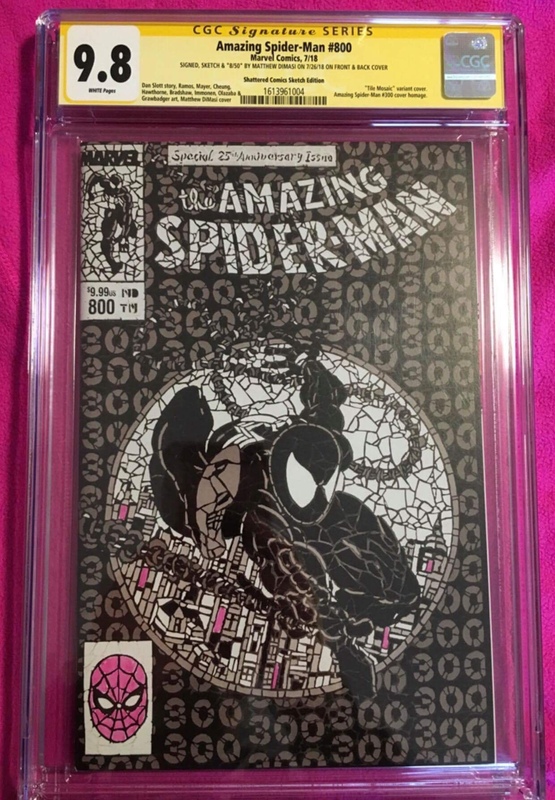 ~~~ The 50 graded PINK editions will be auctioned off on the Shattered Comics eBay page with the first auction beginning September 30th at 10:00 pm & ending 10/1 at 10:00 PM est. One a day will be listed in a 24 hour auction with 100% of the proceeds to benefit Making Strides of Concord NH. ~~~ 250 raw copies will be made available on Shattered Comics eBay the first day of the NYCC for those that cannot attend the show, restrictions will be in place on the eBay listing. ~~~ The remainder of the books will be available at the New York Comic Con 10/4, 10/5 & 10/6 (Thurs. Fri & Sat). Shattered Comics & Little Giant Comics would like to personally thank each and every one of you that have supoorted the Shattered Comics Variant program this year! Looks sweet and a great cause. Likely out of my price range though. There are two versions. The regular and the colored graded ones. We have a special for #24.